In order to find something, you first must lose it. I struggled with what it is I would leave behind. It's been at least three years since I've lived out of a backpack, recognizing that experiences are far more valuable than things. This trip was also an opportunity for me to catch up on reading, and there were so many books I wanted to bring as my companions. While it's easy to download ebooks on my iPad, there's nothing like the feeling of being able to flip through paper pages until it becomes crinkled with written notes, highlights, and memories of its reader. I crammed two books into my bag, but upon arrival at the airport narrowed my choice down to one to lighten my weight and to focus on a single theme or story as a guide for my trip. I chose "How to Free Your Mind: The Practice of Tara the Liberator" by Thubten Chodron. "The story tells us that Tara was a princess named Wisdom Moon, who was very devoted to the dharma and had a deep meditation practice. She was close to enlightenment, raising the intention to reach enlightenment for the benefit of all beings, when a monk approached her and said what a pity it was that she was in the body of a woman, because she would have to come back as a man before she could become enlightened. The princess answered back brilliantly, demonstrating her understanding of emptiness and absolute truth, saying, 'Here there is no man; there is no woman, no self, no person, and no consciousness. Labeling ‘male’ or ‘female’ is hollow. Oh, how worldly fools delude themselves.'" 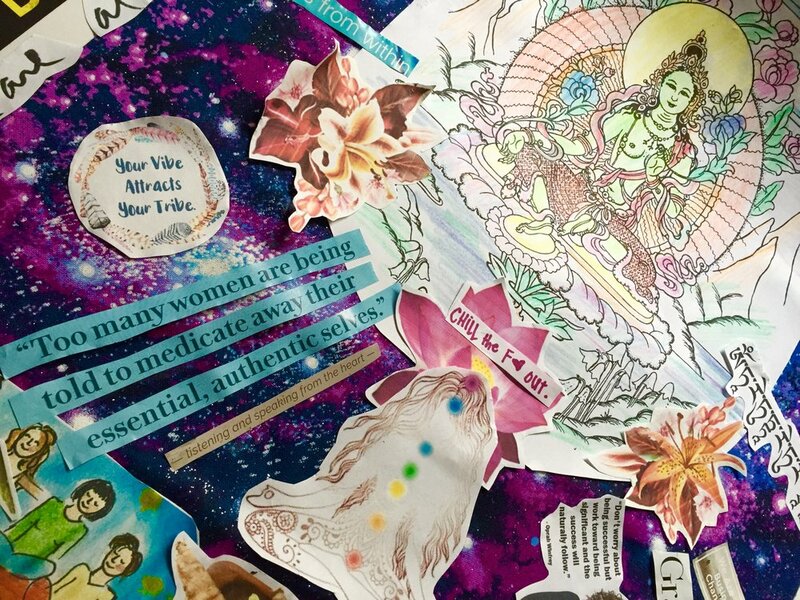 While there are many variations of her story, one thing remains the same: Instead of entering Nirvana as the goal of all those who reach enlightenment, she made a conscious decision to be reborn into every lifetime in a woman's body until all people in this physical realm are free from suffering - and, in my interpretation, where gender, race, and class are no longer barriers toward anyone's liberation. I've been healing my relationship with Buddhism, tired of spirituality being consumed as a commodity and used as a means to bypass the human condition of suffering and systemic injustice. I grew up with my mother justifying every injustice done to her or others as "karma". It wasn't until I was introduced to Engaged Buddhism and Green Tara this past year where I started to feel at home again, which led me to ordering this book during the new year - and even placing her on my 2017 vision board. Green Tara's color symbolizes activity and success... She represents the purified aspect of the element of air, which activates growth in the world. Just as the air element generates growth of green plants, which consequently brings the uplifted spirit of springtime after the dreariness of winter, Tara's enlightening influence makes our good qualities bloom and leads us to the freshness of liberation after the oppression of cyclic existence. Her "dancing pose" is relaxed, open, friendly. Her outstretched right foot indicates her readiness to step into the realms of suffering, confused beings in order to help us. She doesn't shy away from suffering but faces it fearlessly and compassionately, thereby counteracting it. Her left leg is tucked in, demonstrating that she has full control over her subtle inner energies. No matter whether others praise or blame her, harm or help her, her energy does not become unbalanced and she does not lose her equanimity. She holds a blue lotus (symbolizing power and purity) in her right hand (which is held at chest level) in the vitarka, or teaching mudra, and the left hand is in the varada mudra, or gesture of giving. There's so much more to learn about her, and I looked forward to the day I would encounter her in person. Tara, whose name means “star” or “she who ferries across,” is a Bodhisattva of compassion who manifests in female form. In Tibetan, Tara is known as “Dölma” (Sgrol-ma), or “She Who Saves.” In particular she represents compassion in action, since she’s in the process of stepping from her lotus throne in order to help sentient beings. Upon arrival to Chiangmai, I was starting to feel much self-doubt and questioned whether or not I had made the right choice about coming. While I was excited to be in a space to learn about ancestral healing, Anne and I were the only people of color and of Thai descent in our class aside from the instructor and her assistants. What was my purpose of being here when even my own people didn't see the value of upholding this practice? My body was experiencing a range of emotions: anger for non-Thais consuming our fading traditions, sadness for the loss of my own cultural identity, and guilt for having access to it as an American. On our first day of class, we began with Rasidaton (Thai Yoga) and Buddhist Pali chants while paying homage to the various depictions of Buddha Gautama and Maw Chiwok, or Shivaga Komarapat (Buddha's doctor), placed on the altar. Considering we were studying an ancient healing technique passed down by women, I was feeling uncomfortable with the lack of female representation among these spiritual male deities we were bowing our heads to. At the end of our Rasidon, I stood up to look more closely at them, especially one in particular that was not formally introduced to us by our teacher. There she was, staring right down at me with her palms open and offering a lotus to welcome me home. I have a long way to go in transforming my anger, fear, rage, and jealousy into forgiveness and compassion for all sentient beings - especially for myself. This is what Tara is here to teach me, along with many other lessons that are still unfolding. While I am working through my feelings of being a second generation born American who has had a lifelong struggle with assimilating to dominant culture, I would not be on this beautiful journey finding where it is my ancestors came from along with the reclamation of intuition had I not lost it. Rather than compare myself to others, this journey is of my own and is also greater than my own understanding. So what guidance is Tara providing for me, and what lessons does she also have for you? The syllable Om has no conceptual meaning, and is sound representing the entire universe, past present and future. The central part of Tara’s mantra is a loving play on her name. According to Sangharakshita, a traditional explanation of the mantra is that the variations of her name represent three progressive stages of salvation. 1. Tāre represents salvation from mundane dangers and suffering. Tara is seem as a savioress who can give aid from material threats such as floods, crime, wild animals, and traffic accidents. Tara is therefore said to protect against ordinary worldly dangers. 2. Tuttāre represents deliverance into the spiritual path conceived in terms of individual salvation. In traditional terms, this is the path of the Arhant, which leads to individual liberation from suffering. This is seen in Mahayana Buddhism as a kind of enlightenment in which compassion does not figure strongly. Tara therefore offers individual protection from the spiritual dangers of greed, hatred, and delusion: the three factors that cause us individual suffering. 3. Lastly, ture represents the culmination of the spiritual path in terms of deliverance into the altruistic path of universal salvation – the Bodhisattva path. In the Bodhisattva path we aspire for personal enlightenment, but we also connect compassionately with the sufferings of others, and strive to liberate them at the same time as we seek enlightenment ourselves. Tara therefore delivers us from a narrow conception of the spiritual life. She saves us from the notion that spiritual progress is about narrowly liberating ourselves from our own suffering, and instead leads us to see that true spiritual progress involves having compassion for others. By the time we have been liberated from mundane dangers, liberated from a narrow conception of the spiritual path, and led to a realization of compassion, we have effectively become Tara. In Buddhist practice the “deities” represent our own inner potential. We are all potentially Tara. We can all become Tara. Soha, according to Monier Monier-William’s Sanskrit Dictionary, means: “Hail!”, “Hail to!” or “May a blessing rest on!” We could see this final blessing as symbolizing the recognition that we are, ultimately, Tara. May we all awaken the Tara that illuminates inside each one of us.